Highly Important Sale of Circa 5.99 Acres / 2.42 Hectares approx. 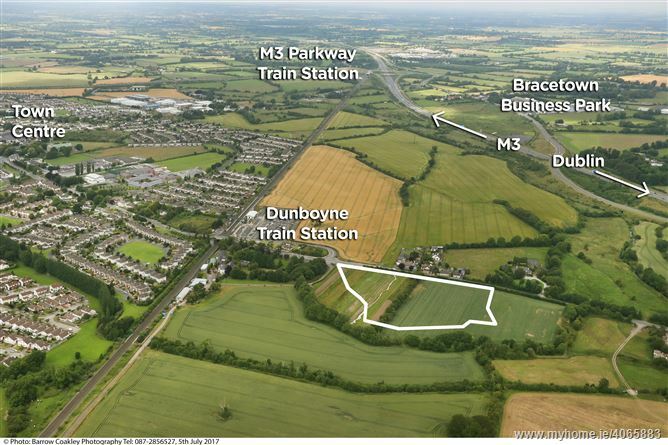 of Prime Zoned Residential Development Land at Station Road, Dunboyne, Co. Meath. •	Immediate proximity to M3 and M50. •	16 kms from Dublin City Centre in desirable rural setting. •	Excellent Rail & Bus links. From Dublin. Take M3. Exit at Junction 4 for Clonee Dunboyne. Through Clonee Village. Lands for sale on left just before entrance to Dunboyne Train Station. ITM Co-ordinates: E.702138 N. 741703. Strictly by prior appointments only.